Taking the first step into treatment for drug addiction and alcoholism is difficult. It is especially difficult for LGBT folks. Upon entering the Day or Night LGBT Program, clients will be familiarized with the facility and the staff. Clients generally attend the Day or Night program for a minimum of 30 days. 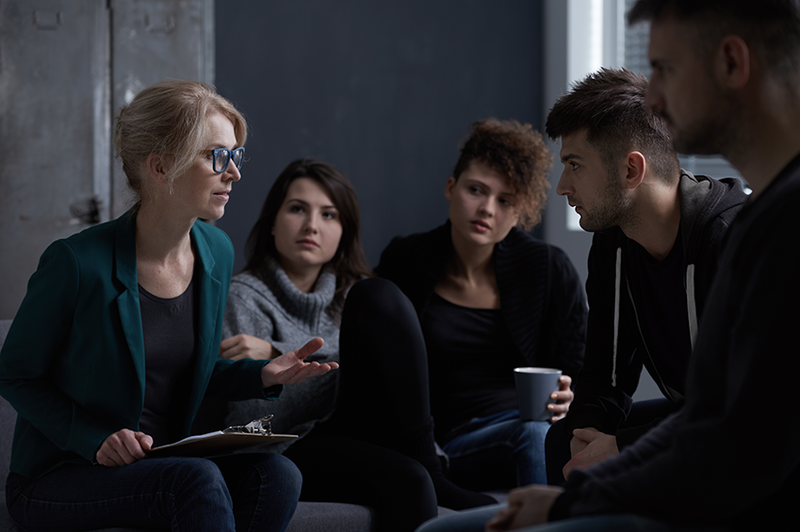 The adjustment to a drug rehab environment can be overwhelming for anyone, whether they have been to a rehab center before or checking in for the first time. Clients are encouraged to settle in, become comfortable and feel welcome. The level of trust and comfort that develops just from being amongst LGBTQIA+ peers is second to none. Our goal at Inspire is for clients to feel safe under the care of their therapists, surrounded by LGBT peers, in an environment that promotes community and unity. During this level of treatment, careful attention is given to clients for the purpose of understanding where the individual might need the most support and to minimize the risk of relapse. An emphasis on relapse prevention during the Day or Night LGBT Program can help to ensure success in the following phases of care at Inspire Recovery. Day or Night level of care is designed to provide a period of time that minimizes stress on the client by eliminating some of the distractions or everyday life. During this initial phase of an individual’s treatment program, clients engage with the therapeutic and psychological help necessary to make foundation-level progress in recovery from addiction. Day or Night LGBT Programs are similar to Partial Hospitalization (otherwise known as PHP). Clients enrolled in the Day or Night LGBTQIA+ program will receive a greater amount of therapy then our Intensive Outpatient program (otherwise known as IOP) and Outpatient Program (or OP). Day or Night clients will be involved in more face-to-face interaction time with their therapists and other counselors. It is typical for clients to enter treatment at the Day or Night level of care before they are able to transition to IOP. At Inspire Recovery, our Day or Night LGBT program is 5 days a week with activities such as 12 step meetings, LGBTQIA+ community activities and outings to show how to have fun in recovery while being a productive member of society. Everyone entering our treatment center will likely begin with our Day Night LGBT Program. This is the highest level of care we provide. It is for people early in their recovery, for those who may be at risk for relapse and those who may be likely to involve themselves in other high-risk behaviors. It is a period of stabilization and deep assessment in order to devise the aspects of an individual’s ongoing treatment plan. In this way, a client’s full treatment plan can be determined and a working method for effectively structuring their treatment plan can be developed. This phase lays a foundation for what will occur after the Day Night LGBT Program. At Inspire Recovery a Day or Night LGBT program is also provided to those who it is necessary to have a high level of therapeutic care. Many people who arrive for drug and alcohol treatment have what is referred to as “co-occurring” disorders. This means that the individual has a mental health diagnosis as well as an addiction. Our therapists, case managers, behavioral health technicians & administrative staff are all here to make the time spent at Inspire helpful & healing. We know that there is a lot going on inside the mind of someone entering rehab. We are here to help people learn more about themselves and the roots of their addiction. By facing our addictions we are able to prevent relapse. By creating a safe space for the LGBTQ community in recovery, we are also here to create a supportive environment for those who are gay, lesbian, bisexual, transgender, queer, questioning and every aspect of the vibrant LGBTQ+ community. The formal criteria for clients being enrolled in our Day or Night Program are individual based. If an LGBT client is being “othered” is an othere center and they meet criteria a assessment will occur. Those with medical conditions or complications will also be evaluated for Day or Night enrollment, as well as those with emotional, behavioral or cognitive conditions. In order to determine whether Day or Night is the right level of care for a client, the individual will undergo an evaluation with a licensed substance addiction treatment professional. A mental health or physical health diagnosis will be made after an initial assessment that determines the client’s level of care. Such diagnoses will be made at a later time and date by our clinical and medical team. If the conclusion is drawn that a client is a good fit, they will be admitted to our Day or Night LGBT program. Access to psychiatric and medical necessities will be provided, as well as lab services and additional forms of support. However, if a client needs a higher level of care, such as a Residential Treatment facility, the admissions team at Inspire Recovery will be able to assist with such recommendations. Keep in mind many that many of our transgender clients may have Gender Dysphoria that has not been considered before entering Inspire Recovery. Once treated, perhaps with hormones, an LGBTQ affirming therapist and emersed into peer community many previous symptoms such as depression & anxiety may be lifted. © 2019 - Inspire Recovery LLC. LGBTQIA+ Drug & Alcohol Rehab. All Rights Reserved. Serving the Lesbian, Gay, Bisexual, Transgender, Intersex, Allies + the rest of the Queer community recovering from addiction & trauma in a rehab setting.